Udaipur: Dozens of chartered planes carrying celebrities, including former US secretary of state Hillary Clinton, flew into a sleepy airport in western India for the lavish pre-wedding festivities for the daughter of India’s richest man. 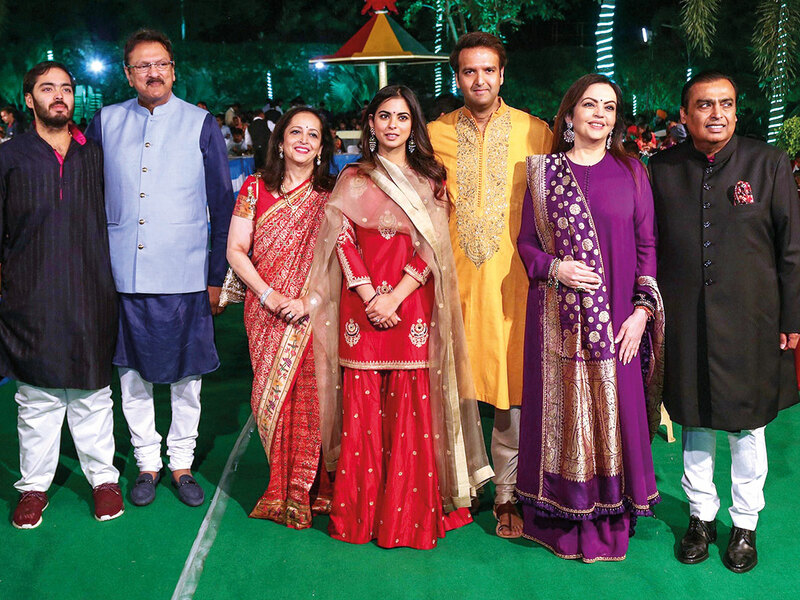 Isha Ambani, 27, daughter of Reliance Industries chairman Mukesh Ambani, will marry Anand Piramal, 33, in the financial capital of Mumbai on Tuesday, but the celebrations began over the weekend in the desert city of Udaipur, with feasts, singing and dancing, and other pre-wedding rituals. Grammy Award-winning singer Beyonce gave a power-packed private performance at the pre-wedding celebrations. The pop star performed for a star-studded audience, which also included a slew of Bollywood celebrities such as newly-wed Priyanka Chopra and her American singer husband Nick Jonas. Beyonce, who performed numbers like “Perfect” by Ed Sheeran and belted out her greatest hits, chose a thigh high slit red and gold dress with a plunging neckline by designer duo Abu Jani-Sandeep Khosla. Beyonce’s private concert was much talked about since September, when American singer John Legend performed at Isha and Anand’s engagement at an equally lavish ceremony in Italy’s Lake Como. “The event had many visitors from abroad, so customs and immigration counters were set up at the airport and will remain active for the next five days,” said an official at the airport. Outside, guests were awaited by luxury sedans driven by chauffeurs in colourful Rajasthani turbans. Guests for the celebrations were given access to an app mapping out the activities, including the private concert by Beyonce. Sources declined to say how much Beyonce was being paid for the concert and media have not reported a figure. The wedding will bring together two of India’s most influential families. Ambani, the chairman of Reliance Industries, has a net worth of $47 billion (Dh172.5 billion). The Piramals have interests in pharmaceuticals and real estate, and have given the couple a 4,645-sq metres sea-facing home in Mumbai. The Clintons and the Ambanis have an association that goes back more than 18 years and have met several times both in India and abroad. Then President Bill Clinton held meetings in India with the Ambanis, including deceased founder and Mukesh’s father Dhirubhai Ambani, just before and after he left the presidency in 2000-2001. In March this year, when Hillary Clinton visited India to deliver a keynote speech at a conference in Mumbai, she dined with the Ambanis at their 27-floor Antilia residence — one of the world’s most expensive homes. The wedding is the latest in a series of high-profile marriages that began last year, when cricket captain Virat Kohli tied the knot with Bollywood actress Anushka Sharma. Just last week, actress Priyanka Chopra and US singer Nick Jonas had a two-day wedding at one of India’s most ostentatious royal palaces.